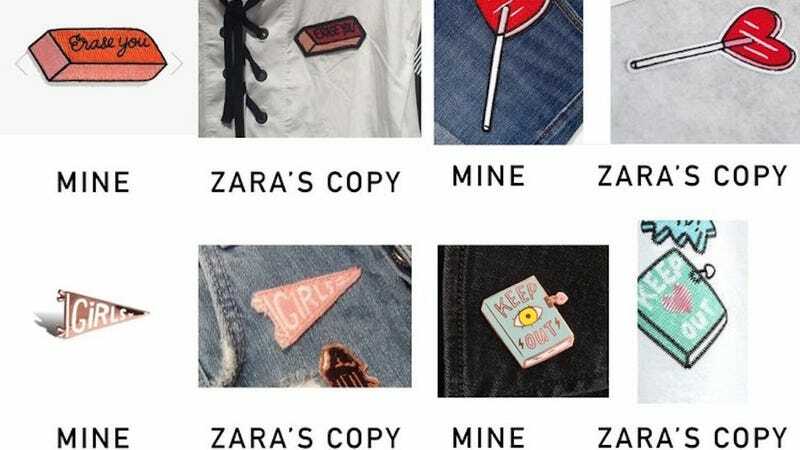 Zara, the Spanish fast-fashion empire that’s made a whole business out of “borrowing” ideas from other designers, is back at it again! Their latest victim: Tuesday Bassen, an indie artist with a large internet cult following thanks to her illustrations and line of pins, patches and apparel. We reject your claims here for reasons similar to those already stated above: the lack of distinctiveness of your client’s purported designs makes it very hard to see how a significant part of the population anywhere in the world would associate the signs with Tuesday Bassen. Sure, there is the merger doctrine, a caveat to copyright protection that holds that if there is only one conceivable way or a drastically limited number of ways to express and embody the idea in a work, then the expression of the idea is not copyrightable because ideas may not be copyrighted. Given that Bassen’s illustrations consist of intricate details, such as the “Keep Out” and heart-lock designs on the diary (as opposed to a more simplistic drawing of a diary) or the “Erase You” writing on the eraser (as opposed to a straightforward drawing of an eraser), which were all re-created by Zara, this is arguably not an applicable exception. There are certainly ways of depicting the aforementioned ideas - a journal, an eraser, etc. - without including the details included in Bassen’s works, suggesting that the merger doctrine may not apply in the case at hand. Bassen, who’s already paid thousands of dollars in legal fees, says that she will continue to fight Zara, both for her work and the work of other artists.